The ninth-century Berne Scholia, which is an annotated version of the Pharsalia, expands on this, saying that Teutates (Mercury) demanded drowned victims, Esus (Mars) preferred hanging while Taranis (Jupiter) liked burned offerings. Since both Julius Caesar and Strabo described the Gauls burning victims in a “wicker man” it has been assumed that Taranis was the god they being sacrificed to. Very interesting 😀 The first reference I remember reading of Taranis was in a Asterix The Gaul book! About the wheel (especially when paired with the eagle and the god) and the thunderbolt. They remind me of the tarot Wheel of Fortune, The World (a circle with the eagle, etc) and The Tower. If symbols are combined, perhaps the intention was to convey that Taranis was the god of changing/sudden fortune as well? The wheel is a symbol with many meanings. The Romans would have seen the wheel as connected to Fortune, in particular their goddess Fortuna. I think to the Celtic peoples it tended to signify good fortune, but of course I’m speculating. It’s interesting, though, to think that it would have such different meanings to a Gaul and a Roman viewing the same image. Yes, it is. So much of how we interpret symbols depends on our upbringing and society. Nice to know we still have much in common with our ancestors 😀 And best of all is expanding our knowledge and knowing there’s more than one way to look at things. Informative and food for thought. Thanks! Interesting. it certainly give an addition to Roman mythology and perspective of their Gods. There’s nothing like seeing someone as others see them to give you perspective. Thanks for this informative article. I knew Taranis was associated with the wheel but not with the eagle. That’s interesting. In ‘Culhwch and Olwen’ we do find a character called Glinneu son of Taran, who is the son of Taranis, but don’t hear anything about his father. 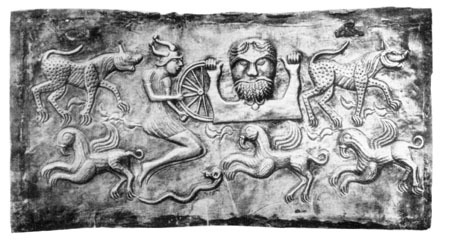 I’m not sure why some Romano-Celtic gods made it into the Welsh myths and others didn’t or why, contrastingly, gods like Manawydan and Gwydion did yet we have found no inscriptions to them (as yet). Is there any chance we could republish this on the Taranis page on the Brython site? You can certainly use my post on the Brython site. I hope your followers find it useful. I love these echoes between mythologies. You can explain them in different ways, but they’re always intriguing.